Prophet Muhammad (pbuh) said: “No blessing other than faith is better than well-being”. Dieting, especially weight loss is a current phenomenon in modern world. Weight loss industry is huge and no country is safe from its globalized clutches. According to ABC news report “the annual revenue of the U.S. weight-loss industry, including diet books, diet drugs and weight-loss surgeries is $20 billion”. Furthermore there are 108 million Americans on diet. Another epidemic that has come with extreme dieting and fad dieting is various forms of eating disorders. Medical journals are full of how so and so yoyo dieting has reportedly led a dieter to developing binge eating disorder, anorexia, bulimia or any other form of eating disorder ( not to forget the detrimental impacts on one’s physiological and psychological health). It is clear that one of the causes of eating disorders, anorexia bulimia is dieting and restriction of calories. All form of eating disorders has some link to innocent act of going on one of the famed diets to shed few kilos. I guess that’s where above statement makes sense that we should not expose ourselves to diets, fad diets that can cause risk to our physical and mental health. In this age, due to unlimited access to information, doctors, dieticians and nutritionists, we need to refrain from diets that are devoid of aesthetic and health benefits. We all know that such diets sabotage our health in long run and have unpleasant affects on our health. “Prophet’s statements: “Be keen to do what is beneficial to you”; Store up enough health to draw on during your illness; “Whatever you feed yourself counts as a benefaction”. Similarly, “Your soul has a [human]right against you; your body has a [human]right against you; your eyes have a [human]right against you”. It is all about being mindful and responsible for decisions we make regarding our health. Therefore, it is pivotal to consult your physician before you start any weight loss program. If a member of family or friend has become a victim of eating disorder, then it is the duty of family members to seek as much medical, psychological, and spiritual help as necessary to treat the problem. This is a dangerous illness, if left untreated, some of the effects are irreversible and life-threatening. Every sickness has a cure, Allah has not Sent down a disease except that He Has also Sent down its cure. 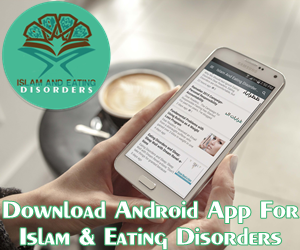 Eating Disorders- Human Body in Islam. Do we respect our body?